with the cold weather upon (most) of us, dry skin can be a problem, even if we don’t battle it year-round. the air is naturally drier, as is our hair, scalp, and skin. keeping your face clean is a must, but we don’t want to dry it out even more as we wash it. the OCM (oil cleansing method) is a great way to keep our skin clean and moisturized, but it doesn’t work for everyone, and can be time consuming for a regular routine. face masks are a great way to pamper yourself and your skin, all while keeping it clean and toxin-free. these masks are for dry skin (of course you can use them year-round!) and are completely DIY… my favorite! you can do these masks 2 to 3 times a week, as they will not clog pores and are geared towards sensitive skin (yes, even acne-prone skin). there are certain ingredients that i love for moisturizing my skin. these can ALL be mixed and matched for a special masks tailored to suit your skin needs. if you want to play around with mixes, start in very small batches (to not waste ingredients) and see what works best. i’ll add my favorite mixes below! the ideal amount for a single use mask will be 2 to 3 tablespoons of mix (whichever ingredients you decide to use). keep this in mind when you’re using multiple moisturizing ingredients. you always want them to equal up to 3 tablespoons; not 2 to 3 each! these base ingredients will make up the bulk (or all of) your moisturizing face masks. you can use 1 or all of the ingredients. play around with ratios and have fun! activated charcoal – this ingredient will purify your skin and help clear up blemishes (great for acne-prone skin!). add 1/2 capsule to every 2 tablespoons worth of moisturizers you use. bentonite clay – this clay draws toxins from your skin and tightens pores. 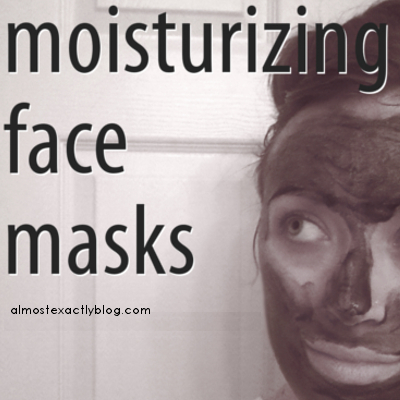 in moisturizing masks, the clay needs to be a very small part of the overall mix, to not cause dryness. for every 2 tablespoons of moisturizers you use, add in 1/2 teaspoon of the benny clay. MSM powder – msm powder will exfoliate your skin without drying it out. it’s great for blemishes, scars, and acne. for every 2 tablespoons of moisturizers you use, add in 1 teaspoon of the powder. again, these aren’t necessary, but who doesn’t like smelling nice things? add any essential oils you love into your moisturizing face mask mix. as a basis for how much to mix in, a drop or two (depending on the strength of the EO) will do wonders for every 2 to 3 tablespoons of face mask mix you have. although not an essential oil, i love adding rose water to my masks. in a small bowl, mix 1 tablespoon pure aloe, 1/4 tablespoon raw honey, 1/2 tablespoon yogurt, 1/2 capsule activated charcoal, 3 drops of sweet almond oil, and a light drizzle of rose water. once thoroughly mixed, rub in gentle circular motions onto a clean face. let sit for 15-20 minutes and rinse with cool water and a soft washcloth. this mask is great for all skin types that need a heavy dose of moisture for whatever reason, but it is especially great for purifying your skin, as well as healing and lightening blemishes. in a small bowl, mix 2 tablespoons pure aloe and 3 drops emu (or argan) oil. once thoroughly mixed, rub in gentle circular motions onto a clean face. let sit for 15-20 minutes and rinse with cool water and a soft washcloth. this mix also doubles as a great scalp moisturizer! the amount of emu/argan oil in the mix shouldn’t leave your hair greasy. if you’re worried it could, start with only a drop for every 2 tablespoons of aloe you use. apply to your scalp when your hair is dry, leave on for 20 minutes and rinse with cool water. what are your favorite ways to moisturize dry facial skin? what are some mixes you want to try? leave your tips and favorites below! this post is about periods. I want to try this moisturizing face mask however I am allergic to dairy products. Is there a good subsitute for the yogurt!! I would appreciate any feedback! Hi! I absolutely love your blog and it has been a great inspiration for me towards chemical free beauty care. The thing i was wondering about was do you have any experience about alkaline bath care salt? I´ve been water only for few weeks now and recently washed my hair with this salt. It made my hair so clean and soft but the thing I was wondering is did it strip my hair out of it natural oils. Also do you think that it would be ok to use dry shampoo (flour&cacao) in this transition phase? It just helps with my hair alot! I have found that coconut oil is not enough this winter to keep my arms and legs from drying out. I figure these face masks would work but would be expensive if used full body. What other suggestions do you have for full body moisture? If you Support online purchasing a good place to order from is called apothacary.com It has some good basic products for cheapish prices including alchohol free witch hazel! Where do you find your activated charcoal? What type of rose water do you use? The type you cook with or the scented one you can’t eat? Could coconut oil be used as an oil for this? hey kate! unfortunately coconut oil is too heavy an oil for a face mask. it could clog your pores. but I do looove CO!